So for the first time in 2017 I decided to do some squats, some very light squats, not crossing 135 pounds. 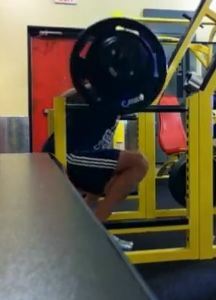 Because of the IT band and knee pain I have been having squats have been off the menu for a long time. I recently restarted my running and had a bit of IT/knee discomfort as I did my reps, making even the light weight feel somewhat uncomfortable. I worked through my three sets of 10. We will see how I feel as a result the next couple days.